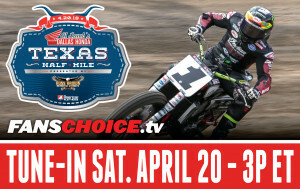 If you’ve attended an American Flat Track race over the last several years, or watched coverage of one on FansChoice.tv or NBCSN, you may have noticed sponsor signage or commercials touting a certain jewelry sponsor by the name of Thom Duma Fine Jewelers – or TDFJ. You wouldn’t be alone thinking there might be a bit of a disconnect between fine jewelry and things like oil or tires. Or exhaust systems and pistons. Or gaskets and brake pads. But in this case it fits perfectly. And the reason it does is that Tommy Duma, who owns and runs Thom Duma Fine Jewelers, isn’t just a superb jeweler and a huge fan of flat track racing. 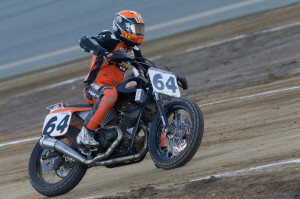 He’s also an ex-professional flat track racer, and a pretty good one, too. Like so many baby boomer motorcyclists, Duma, who’s 58, started out on Tecumseh- and Briggs & Stratton-powered minibikes in the late 1960s, eventually moving to slightly more advanced machines such as Honda’s SL70. 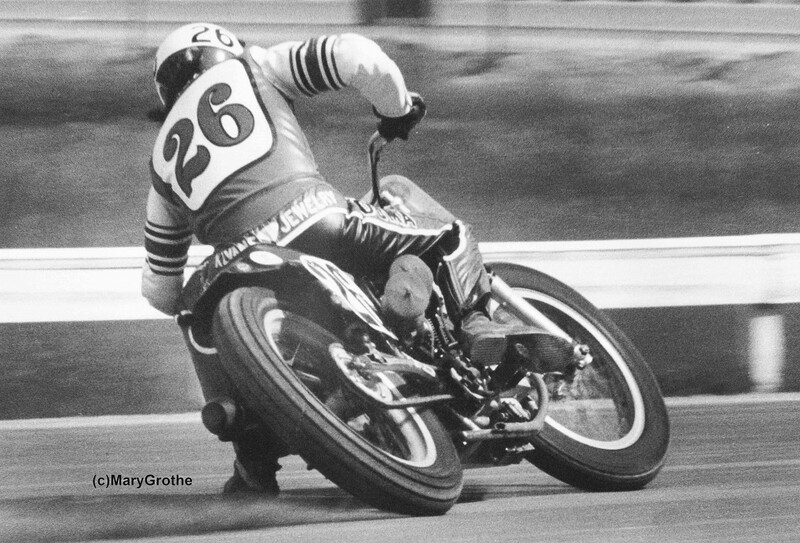 His Mom and Dad both owned businesses in Northeastern Ohio, but when his mother sold hers she became Tom’s two-wheeled enabler, first hauling him and his friends to the local scrambles, and a year later helping him turn that SL into a flat track racer, complete with paper-plate number plates. Over the years Duma raced Noguchi/Yamaha 100s and 125s, 250 and 360cc Yamahas and, later, the vaunted XR750, turning pro at sixteen and eventually becoming a Junior, then Expert, and riding with the top-level pros at AMA Nationals. His Mom was there for many of those years, helping and working and financing, right until she passed away in ’77 after a bout with cancer. Duma followed his father into the jewelry business after hanging up his steel shoe in the early 1980s and has been at it ever since from his company base in Warren, Ohio, just a stone’s throw from Youngstown and just 45 minutes from the Cleveland area. Duma’s not only a fan and supporter of American Flat Track, as TDFJ is the Official Jeweler of American Flat Track. He epitomizes the difference between sponsor and partner, staying involved with the paddock and custom-building the rings given to each year’s champions at the year-end Awards Party – this year at Manhattan’s Classic Car Club just a few miles from the MetLife Sports Complex raceway, home of this year’s AFT finale the evening before. Tommy Duma (checkered shirt) with 2018 AFT Twins presented by Vance & Hines champion Jared Mees (left, showing ring) and Mees crew chief Kenny Tobert (right) at this year's Grand Awards Party at Manhattan's Classic Car Club. Several broken bones in your foot and a cracked vertebra in your neck. That doesn’t sound good. It’s been difficult for sure. I have surgery on the foot in a few days, so hopefully I’ll rebound quickly and get back on the track by Spring! 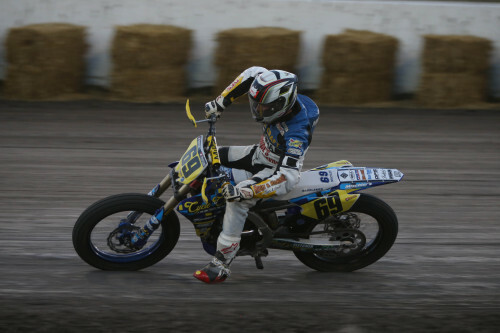 Maybe a dumb question, but why support American Flat Track? Well, it’s a passion project. I do it for the relationships, both in and out of the paddock. It’s great to be there at the end for the champions, but also getting to reach the wider racing community along the way has meant just as much. The reason I linked back up in the first place is because of the Rookie Class of ’79 reunion almost ten years ago. They introduced us in front of the fans, and I shared the stage with my longtime rivals and buddies Scotty [Parker], Wayne [Rainey], Ronnie [Jones], Charlie [Roberts] and Johnny [Wincewicz]. It got me thinking of how to collaborate with this community again. Just being able to support the guys – and girls – who go out there and represent the sport so well has been a privilege. Tell us about those rings. They are pretty spectacular. They really are. To be honest, each year we sit down – my sons and I – and get out the pencil and paper. We start sketching until something looks good and from there we get the computers involved – around 120 hours of modeling time back and forth with the production team. We like the rings to be unique for the riders each year. The AFT Twins ring has over an ounce of 18-karat yellow gold, 40 labor hours to set 161 diamonds, some white, some black, all of which form the number 1 on top of the ring. And the AFT Singles ring has over an ounce of white gold, with about the same number of diamonds on the top, but in reverse color. Both rings have over a full karat worth of diamonds, and their retail cost would be about $13,000 and $10,000 respectively. We’re pretty proud of how they turned out, and it was great presenting them to Jared and Dan at the Awards banquet. Duma, showing off the rings he and his sons designed for the AFT Twins and AFT Singles champs. Like a lot of boomer kids you started riding pretty early. I was born in 1960, so by the time I was able to ride bicycles and such I noticed kids riding mini bikes in the woods near our home, and of course I wanted one. After my mom sold her dress shop I got one, and soon she was taking me and my buddies to the local races to watch. One thing led to another, and there was some begging involved, and soon I was racing at local tracks with paper-plate number plates on my bike, with number ‘77’ on them done with electrical tape, because sevens were easy to make. There was a lot of short track racing near us, two tracks that ran twice a week within 30 minutes, Deerfield and Western Reserve, so we gravitated to that. My mom was amazing; she was my roadie, my banker, my mechanic. We had fun, and I did well on the minis. And then the racing got more serious? Duma (#496) takes the high line aboard his very trick Noguchi-Yamaha in an early '70s event. I got on an XR and started doing well, riding against guys like Scotty Parker, Wayne Rainey and Ronnie Jones in the regional invitationals. We did OK with product sponsors, and my dad’s business Klivan’s Jewelers helped us stay competitive. Couldn’t have done it without the golden wrench of Dave Hubinski, Bubba Schobert’s future mechanic, and my favorite pit-crew member, my girlfriend – now wife – Jacki. My best race – if I had to pick – was probably Louisville Downs in 1980. Had a great time trial and was leading my heat race over Steve Eklund by a full straight. Everything was clicking … and then my engine blew up. I honestly think I might’ve won that day. But hey, that’s racing. That's Duma (26f), gassing it around the outside of future - and multi-time - Grand National Champ Scott Parker. Or being passed on the inside by future - and multi-time - Grand National Champion Scott Parker. Take your pick. How did you break into the jewelry business? 2018 AFT Singles champion Dan Bromley proudly shows off his Duma-designed championship ring at this year's Grand Awards Party. Special thanks to photographer extraordinaire Mary Grothe, who supplied the two AMA Grand National images used above.